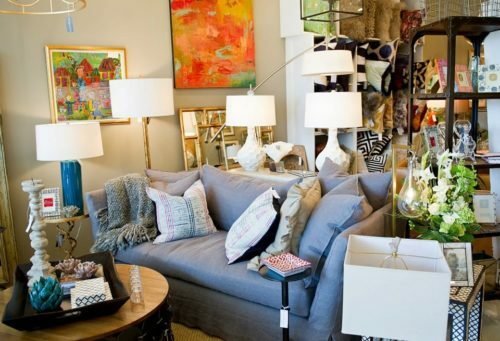 Magnolia carries a variety of upholstery, rug, furnishing, lighting, accessory, and jewelry lines. Our upholstery lines are all made in the United States and includes Cisco Brothers (based in California), CR Laine and Bernhardt (both manufactured in North Carolina). We feature a variety of designer casegood options including mirrors, dressers, dining tables, dining chairs, and more. Primary lighting lines include: Currey and Company, Arteriors, and Visual Comfort, in addition to lines including: Regina Andrew, Barbara Cosgrove, Robert Abbey and more. Magnolia features an in-store Visual Comfort Showroom. Magnolia offers a number of floor covering options from vintage Persian rugs to contemporary options, as well as bedding options, wall coverings, jewelry and accessory lines. Magnolia also features a rotating display of local artists and full service interior design services by Jessica Durham.